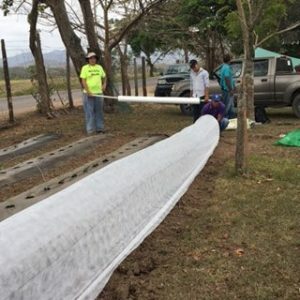 Since joining the Olancho Aid family at the beginning of January, long-term volunteer Delton Phan has been tasked with a number of projects at both Centro Escolar Bilingue Santa Clara and Instituto Bilingue Santa Clara. Some of his responsibilities have included assisting in art classes with elementary students, helping design and paint murals with high school students, implementing a recycling program, and planting gardens at both schools. Throughout his term of service, Delton (known by students as Mr. Phan) has worked closely with with community members to create gardens at both Santa Clara bilingual schools. 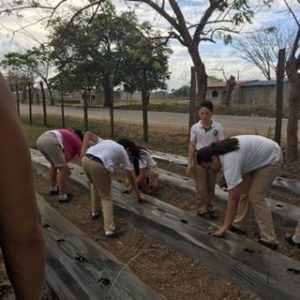 To complete this project, Olancho Aid has partnered with Mario of Project Eden, another non-profit organization in Olancho whose mission is to address hunger issues by providing fresh produce through community gardens. 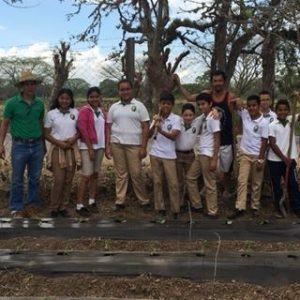 Over the last two months, Delton and Mario have worked with students and teachers to prime the soil, plant seeds, water the gardens, and remove weeds. Many of our students’ families were also able to contribute seeds and lend shovels in order to help get the gardens started. They have planted a number of vegetables, including cabbage, tomatoes, peppers, basil, mint, and squash. The garden has truly come to life in the past few weeks, and students have even had the opportunity to taste lettuce from the gardens that they’ve helped create. As part of the ongoing #HandsOnScience initiative, Delton will continue to work with high school and elementary teachers to incorporate the use of the gardens into their science curriculum and lesson plans during the remainder of his term of service. These gardens will continue to serve over 600 students at these schools after Delton’s departure to join the Peace Corps in Kosovo next month.